Welcome to a fun event put together by some great bloggers out there. This event is here to bring a little joy to one wonderful mother out there. Little Miss Pepper Designs - Thank you for sponsoring :)!! Good luck everyone, and like always, have fun!! "Mother's Day is right around the corner and that means it's time to start thinking about what to get the special mom in your life. I don't know about you, but I don't know a single woman that doesn't love a nice piece of jewelry, especially one that is personalized just for her. 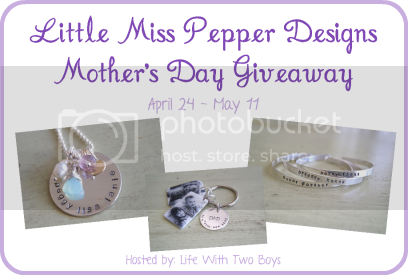 Well, thanks to Little Miss Pepper Designs and Life With Two Boys, one lucky mom is going to win not one piece of jewelry, but a custom jewelry prize pack just in time for Mother's Day!" Disclosure: No compensation was received for this post. Rats and More is not responsible for prize fulfillment. I like the Love Ring Skinny.